Directly across from a community pool and only 236 feet from the beach, Sandpiper offers a world-class locale for vacationers. Located in the much-desired Section O area of the Ocean Sands Community, Sandpiper has every amenity that you are looking for including 2 King Master Suites for added convenience. Getting to and from the beach is a breeze for all, and with so many amenities in the community and right at home, guests will have everything they need for a completely indulgent OBX experience. After exploring the ample shorelines and community amenities, wash off those sandy toes in the outside shower, and relax for a while in the ground level game room with pool table and convenient nearby half bath. There’s also a comfortable sofa on the ground level for watching TV or just lounging around as well as a washer and dryer for sandy suits. The tastefully appointed second level is an idyllic setting for a good night’s rest, courtesy of four well-appointed bedrooms that are bright, sunny, and subtly decorated. There’s a Master King bedroom w/TV/DVD and full bath, a bedroom with Pyramid and Bunk bed and TV, a bedroom 2 Twin beds, a bedroom with Queen bed, and a convenient hall bath with two sinks. With ample room to unwind, guests will enjoy their own private paradise on this level of Sandpiper. The bright and cheerful top level is a fine spot to get together and recant the adventures of the day, thanks to a gracious and open floor plan that allows the sunny Outer Banks light to trickle in and set the scene. There’s a gourmet kitchen with four bar stools, a dining area that fits 12, and a stunning Master King bedroom which boasts a TV/DVD and full bath. A half bath is also located on this level, as well as a sunny deck with a bubbly hot tub and a breezy screened porch. From the sundeck, stairs lead to a rooftop deck which offers ocean views. Enjoy community-wide vistas from the vantage point of your private hot tub, or enjoy long family movie nights in the gracious great room. 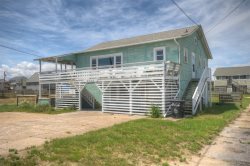 There are miles of fun around every corner at this home, ensuring that families of all tastes will enjoy a fine sample of the good life on the Outer Banks. Top-Level: Great Room, Gourmet Kitchen with 4 Bar Stools, Dining Table Seats 12 (2 Tables), Master King Bedroom w/TV/DVD and Full Bath, Half Bath, Deck w/ Chairs and Picnic Table, Sliders going to Deck, Screened-In Porch; Hot Tub on Deck. Additional Roof Top Deck. Mid-Level: Master King Bedroom w/TV/DVD and Full Bath, Bedroom with Pyramid and Bunk Bed and TV, Bedroom 2 Twin Beds, Bedroom with Queen, Hall Bath with 2 Sinks.